Can levers be added to my Harpsicle® harp? No. The basic Harpsicle® Harp has a smaller arch than do the other harps in the line so there is not sufficient room to add bridge pins and levers. It is possible to add levers to a Sharpsicle™ Harp to upgrade it to a Flatsicle™ or Fullsicle™. Likewise, a Flatsicle™ Harp can always be upgraded into a Fullsicle™. Can accessories like the sticks or stands be stained to match my harp? We do not stain accessories to match harps but the soundboard of all our harps is a lovely, warm, golden color and you will find that the accessories go quite nicely with this light wood. Can I trade in my Harpsicle® Harp for a harp with levers? 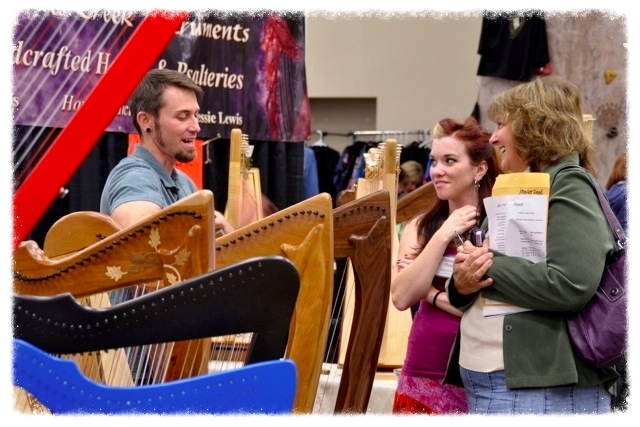 We only take trade-ins on our Rees Concert Line Harps but there is a thriving market for used Harpsicle® Harps. In particular harp teachers and school programs are always on the hunt. If you put the word out, you should not have a difficult time finding a new home for your old friend. Can I have ornamentation or a design added to my Harpsicle® Line Harp? We offer insanely beautiful custom ornamentation and a wide variety of standard ornamentation for our Rees Concert Line Harps but this kind of time consuming, expensive handwork is outside of the current capabilities for our little lutherie when it comes to our Harpsicle® Line Harps. Can I order a custom color? Sadly, no. We have to have our stains custom made by a large supplier and they do not offer the kinds of small quantity needed for a single harp. However, keep an eye on our Discounted Harps & Limited Editions page. Every now and then our painter gets creative and makes limited edition colors. What is my harp Made of? The pillar and arch are solid maple. The soundbox is maple with a poplar tone wood soundboard which has a thin maple veneer. Poplar sounds great but it isn't very pretty so the maple veneer is that gives the soundboard that lovely, golden color. For more on our woods in general, click here. For more on our soundboards, click here. Do these harps have standard string spacing? Funny story! Despite what you may have heard, there is no standard string spacing in harps. In fact, there is no standard of any kind in harps. If you do play harps by other makers and you have become used to the spacing on your harp, you will find that you will adjust to the spacing on your new harp extremely quickly, just like guitar players do when changing from acoustic to electric guitars. Give your brain some credit, it is remarkable how fluidly it adjusts. For more information go here. Can my harp be restrung to a different range? What! Are you nuts? That may seem like a natural question to you but for a lutherie (of any kind of stringed instrument, not just harps) that kind of thing will cause dead luthiers to sit-up and scream. Nooooooooo!!!! If you go lower you would have wet spaghetti for strings and would not get anything which even faintly resembles a decent voice out of the harp. If you go higher the increased string pressure will, literally, tear the harp apart. Every harp by every reasonably modern luthier was designed for a specific string set and these string sets are not interchangeable. If you do change to a non-standard string set you immediately void any warranty on your harp. You are also likely to do damage to your instrument. If you want a harp with a lower range, you will need a larger harp. If the Grand Harpsicle® Harp or the Brilliant!™ Harpsicle® Harp is not quite enough for you, our Rees Concert Aberdeen Meadows Harp has that big, luscious, deep, resonant voice that melts even the hardest of hearts. Can I restring my harp with wire or gut or fluorocarbon strings? Every harp by every reasonably modern luthier was designed for a specific string set and these string sets are not interchangeable. If you do change to a non-standard string set you immediately void any warranty on your harp. You are also likely to do damage to your instrument. The strings on your harp were selected to optimize the voice of your harp. There is not a better string set available anywhere for our harps, if there was we would be using it. How do I touch-up my harp? It varies with the finish of your harp. If you have a natural wood harp in maple, walnut or cherry, click here for detailed repair instructions. If you have one of our new stain finishes or older painted finishes you can use one of our color-matched finish pens to touch-up the color. In either the case of a stained or painted finish, if there is a dent you can repair the dent to some degree, click here. This same page will also give you the step-by-step instructions for applying a gloss coat on top after you have completed the other steps. Can I travel on an airplane with these harps? For our five Harpsicle® Line lap harps the answer is a resounding "yes!" Our customers do it all the time. You shouldn’t have any trouble at all. My husband and I personally took 4 harps at the same time as our carry-ons and the only problem was that everyone wanted us to stop and play them! The day you fly, just walk on with the Harpsicle® Harp in its bag as your carry-on luggage (Do not check it in with the rest of your luggage. It will definitely get damaged if it gets checked). It will easily fit in a standard overhead bin with all the other carry-ons or easily fit in the garment closet in business class or behind the back seat of the very last row (flight attendants will often recommend this). Hundreds if not thousands of harpist have flown with Harpsicle®Harps all over the world with no problems. Do I need a pickup system to hear the harp? Can my harp be heard acoustically While it is plugged into a pickup? This looks like two questions but it is really three and the answers are no, yes, yes. No, if you are playing your harp in any reasonably quiet place it can readily be heard without a pickup but if you are playing in a place where people are talking there is some background noise than, yes, you are probably better off with a pickup. This will be true for any harp. Trumpets and bagpipes are generally loud, harps are not. The final yes is because all of our harps, regardless of being plugged in or not, can still be heard acoustically. For basic information about amplification, click here. Can I get a discount if I am a harp teacher or store and I am ordering multiple harps? We have specific requirements for teachers, internet retailers and music stores. If you do indeed meet these standards than we do have discounted pricing available. We welcome your inquiry.